Sonic nutrition is similar to the that of other fast food restaurants. There is healthy food at Sonic Drive-In, but it's not always easy to find. And Sonic nutrition facts can be hard to sort through. There are many high calories and high-fat burgers, hot dogs and fried food. But there are healthy choices at Sonic, too, including the lower calorie Signature Sonic Slinger. Here is a look at some calorie-smart choices at Sonic Drive-In. Like almost every burger joint, healthy food at Sonic is limited. Sonic's menu is based primarily on their beef hamburgers and fried potato or onion side dishes. There are some chicken selections offered, but most of them are fried. And hot dogs are also offered along with a large selection of milkshakes. So how do you navigate Sonic Drive In nutrition without getting overwhelmed? If you can check the menu online before you go, you'll be able to check Sonic nutrition facts and make a smart selection. When you view nutritional information for each item, you're given several choices so that you can tailor your hamburger to cut calories and reduce fat. If you can't check the menu before visiting, go for grilled items to get the healthiest meal. Or choose a single small burger and skip the high-fat fried side dishes and drinks. The tater tots at Sonic are popular because Sonic is one of the only fast food chains to offer them. A medium order of Sonic Tots provides a whole meal's worth of calories, though. And this menu selection is also loaded with fat and sodium. So what about the burgers? 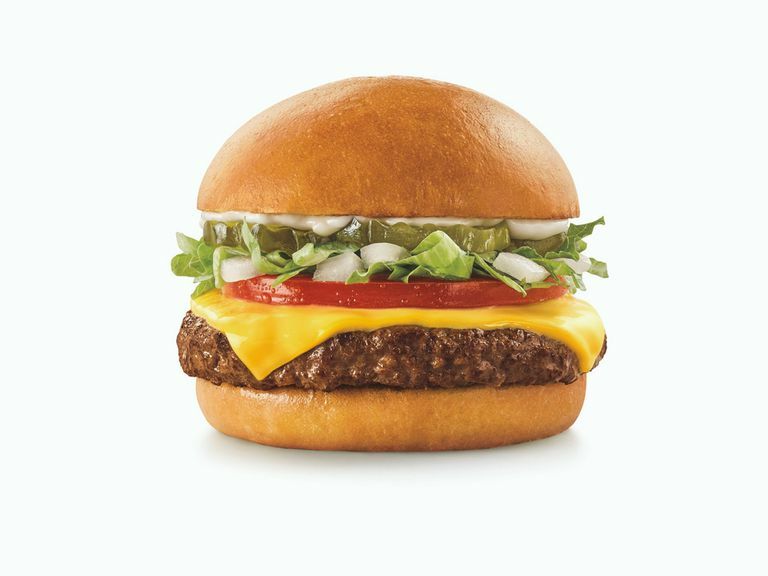 A basic Sonic Cheeseburger with mustard provides 710 calories, 43 grams of fat, 17grams of saturated fat, 42 grams of carbohydrates, 35 grams of protein and 1120 milligrams of sodium. As you might imagine, the larger burgers contain significantly more fat and calories. If you're a smart dieter, you know that the best fast food choices include menu items that are not fried. Healthy options are usually salads and grilled chicken items. At Sonic, there are a few of them to choose from. But you can also include more traditional Sonic items if you have a craving. If you are craving a traditional burger, consider the Sonic Signature Slinger. The patty is made from ground beef, savory seasonings and ground mushrooms—although if you don't like mushrooms, you can't really taste them. As prepared, the burger comes on a brioche bun with real mayonnaise, American cheese, pickles, tomato, and onion. The addition of mushrooms into the patty helps decrease the calorie count, so this hamburger (with toppings) provides only 340 calories. Add an order of mini tots and a drink and you can eat a satisfying meal for under 500 calories. Or combine a few of these other items to create a diet-friendly Sonic meal for under 500 calories. As you can see, even the healthiest Sonic menu items are still very high in calories and fat. If you're on a diet, choose one or two items that you love and split them with a friend. Drink water to keep your drink calories under control. Believe it or not, some of the least healthy choices at Sonic Drive-In are made with chicken. So don't assume that eating chicken is better for your diet than eating beef. These are the items to avoid if you're trying to stick to a diet at Sonic. The full Sonic Drive-In Nutrition information can be found online. It is helpful to use it to check your favorite foods. If you can choose healthy Sonic menu items before you go, you'll be more likely to stick to your diet when you're there.